Enerjii Rest Spray, On Sale! Energjii Rest Spray 0.9 fl. oz. Tired of choking down pills and capsules in an effort to stay well nourished and healthy? Well now there’s a better way – Enerjii Supplement Sprays! This healthy alternative delivers the purest form of nutritional supplements via an innovative and convenient pump action spray. Simply spray the vitamins directly into the mouth for the fastest and most complete absorption of your daily nutritional requirements. 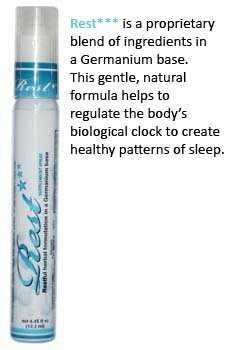 Molecular oral absorption is up to 90% effective, allowing your body to utilize all the necessary nutrients. Pills have a digestion rate of only 10 - 15%, becoming expensive waste when your body passes them through it. There are several advantages to oral sprays. When you travel, or during a busy day, you don't have to worry about carrying around a variety of pills. Enerjii Supplement Sprays come in small, slender tubes, which make them easy to keep in a purse, a briefcase, or even a pocket.